As it’s now more than 2 months since the Kirkup report was published, I thought I’d write a blog about some of national recommendations for change. At some point (hopefully around July), the government will respond formally to the recommendations made by the report. I’m hopeful that this will confirm that the majority (if not all) of recommendations will be taken forward. The Kirkup report made 44 recommendations in total. The first 18 were for the Morecambe Bay trust itself and the final 26 recommendations were for the wider NHS as a whole. I won’t go through each and every one of these, but I thought I’d use this blog to talk about some that I think are especially significant. There are quite a lot, so I thought I cover this in two blogs rather than one. The first national recommendation (19) is that the professional regulators review their investigations into the conduct of registered professionals involved in events at the trust. In my view there are major lessons for professional regulators from looking at what happened at Morecambe Bay, especially the NMC. A particular issue for the NMC has been the system of local supervision. In effect this acted as a primary tier of self regulation that simply put, failed to properly investigate serious incidents or correctly identify serious omissions in the standard of care provided to mothers and babies. I’m aware of other circumstances in other organisations where local supervisory investigations have resulted in similar concerns. The good news is that the NMC have now confirmed that the system of local supervision is to be abolished. Whilst this doesn’t mean that the positive aspects of the supervisory system will no longer exist (these functions are likely to continue but not under the remit of the NMC), it does mean that regulatory investigations following serious incidents will no longer be carried out as part of the supervisory system (recommendation 32 of the report reinforces this). I think this is one of the most important recommendations. In the past I’ve talked about other studies which have highlighted the lack of learning from serious incidents in maternity services. This doesn’t make sense on any level. For families affected by such events, they can be left without answers (or worse still can feel like they are actively being deceived about what happened) which can exacerbate an already desperately distressing situation. For organisations and staff, it means lessons are missed that could prevent the same mistakes happening again. The NHS already spends 1/5 of its maternity budget on litigation. Robust learning from all avoidable harm events in maternity services (and indeed across the whole of the healthcare system) must become the expected norm. Together I think these recommendations are powerful and should result in better quality and more consistent external reviews. If all organisations were required to notify appropriate bodies (including CQC) that an external review was being carried out and provide the findings, this would lead to a greater degree of openness, transparency and understanding of quality issues across the system. I also think the idea of disseminated learning from local external reviews is a very powerful one. Imagine for example, as a CEO or medical director of a trust, thinking about how to tackle a particular problem and being able to access reviews carried out into similar issues elsewhere in the system. Recommendation 27 is for Professional regulatory bodies to “clarify and reinforce the duty of professional staff to report concerns about clinical services, particularly where these relate to patient safety…” The report recommends that “Failure to report concerns should be regarded as a lapse from professional standards. I was pleased to see the new NMC code makes this duty explicitly clear. The challenge of course is that to create the kind of culture where reporting concerns is seen as not only acceptable but desirable professional behaviour is not straightforward. Recommendation 26 of the report is for the “introduction of a clear national policy on whistleblowing.” Stating “As well as protecting the interests of whistleblowers, we recommend that this is implemented in a way that ensures that a systematic and proportionate response is made by Trusts to concerns identified. The issue of whistleblowing in the NHS is one that I’ve been deeply involved with in recent years. 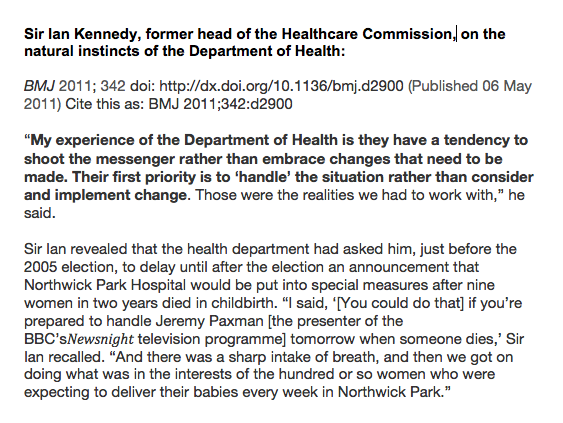 The Kirkup report’s recommendations are borne from the stark and very sad fact that senior professionals at Morecambe Bay must have been aware of serous systemic problems in the maternity unit at FGH from at least 2008, yet very few attempts were made to escalate the issues either within the trust or externally. The reasons for this must be deeper that just a lack of courage from the individuals involved. The culture must have been such that professional staff were genuinely fearful of the consequences of speaking up about the problems. It seems to me that no single recommendation will get to grips with this problem. However, I believe that the recommendations of the recent Francis review, which it seems to me are complimented by those of the Morecambe Bay investigation, if fully implemented will help to start to change this culture. I know it’s possible. In my former job in the nuclear industry we had a scheme whereby if enough safety concerns were raised every month, one would be pulled out of hat and the ‘winner’ given an iPad. At Brighton and Sussex trust, I was really pleased to see the first ‘safety ombudsman’ award given out last month to a member of staff for raising a safety concern – a clear sign of how the culture is starting to change in some parts of the system. That’s my take on some of the key national recommendations of the Kirkup report, I’ll share more thoughts about the recommendations I’ve not covered in my next blog. This entry was posted in Uncategorized on May 25, 2015 by patientsafetyfirst.